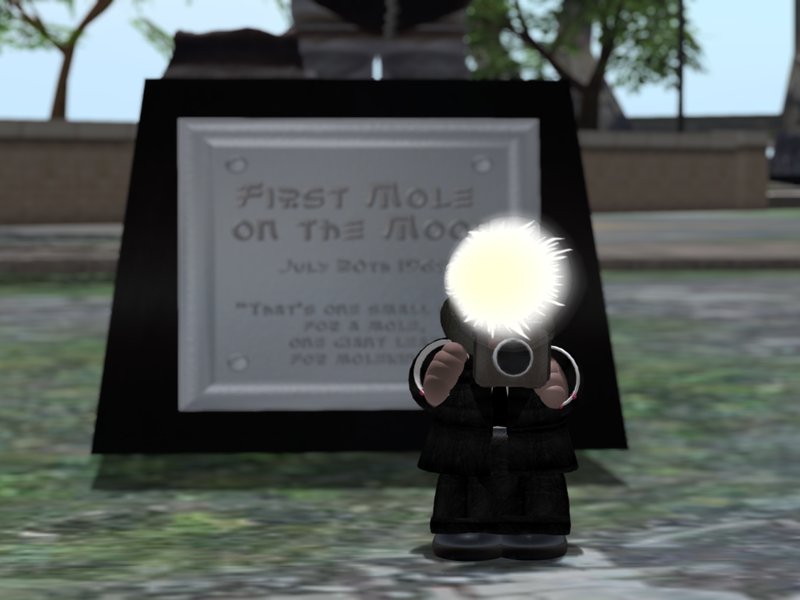 For some reason I had a few extra minutes this morning so I took the time to download pix from my SL camera's memory card and I came across a few images I don't recall shooting. Here they are in order and and some speculative commentary. 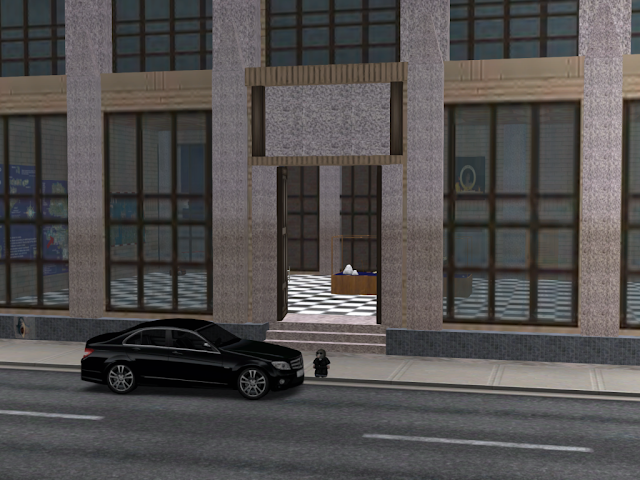 I don't recall being in this part of town recently, but that is the new headquarters of eTV and the Bay City Post in Bay City - Dennis (SLurl). While Linden Department of Public Works Moles are not a strange sight in Our Fair City, I've never seen one in a suit before, or with a black Mercedes automobile. After the second picture I found quite a few images of my feet, the inside of the camera case, and the sky on the memory card. Outside The Pen in Bay City - Mashpee (SLurl - from the roof across the way, I was able to determine after visiting again just this afternoon). A well-known statue across the street from The Pen and the mysterious "Mole In Black" again. That 'flashy thing' could mean the mole is simply a tourist reliving Mole History. Again, after this last photo, there is nothing with this mysterious mole on the memory card, just quite a few snaps of bowling balls from the Hot Balls bowling alley in Bay City - Orleans (SLurl - very near The Pen). 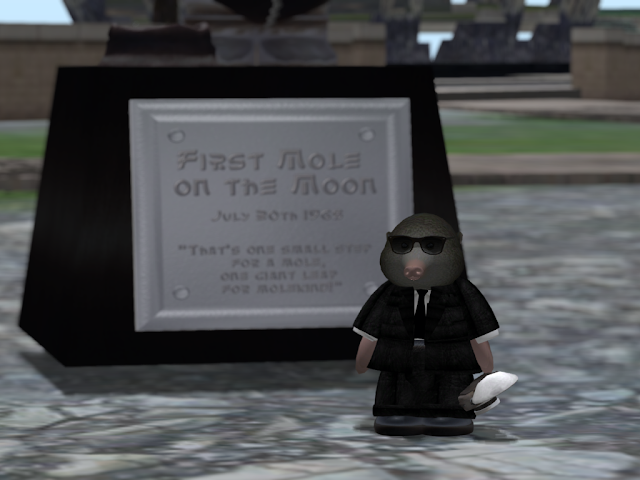 The statue to the First Mole on The Moon is in the park across the street from The Pen. Near the statue is a unique sculpture that shows our solar system, but with a planet I've never heard of before. I documented this here, here, here, and here on the MySL feeds a couple weeks earlier. That visit to the park is clear in my mind as it was a nice outing with my wife, Angela. But the visit to Bay City - Mashpee for the pictures in this post? I don't remember it at all. Adding to the mystery is the image EXIF data which shows that all were taken just this morning.